Bulgaria’s Cabinet has allocated BGN 800,000 (app. EUR 409,000) for completing the restoration of the Early Christian monastery “St. John the Forerunner" (The Forerunner is one of the nicknames of St. John the Baptist in Eastern Orthodox Christianity) located near the southern city of Kardzhali. The St. John the Forerunner Monastery, which was founded in the 6th-7th century AD after the end of the Iconoclasm period in Byzantium, is located on the right bank of the Arda River in Kardzhali’s Veselchane Quarter. It was part of a Byzantine bishopric complex called St. John Prodromos (prodromos in the Greek word for “forerunner"). The ruins of St. John the Forerunner Monastery were first discovered by local amateur archaeologists in the 1930s. More parts of monastery structures were found in 1962, and the entire complex was excavated by Bulgarian archaeologists in 1980-1984. The archaeological excavations have revealed that the St. John the Forerunner Monastery has four churches built consecutively one after another in a typical Byzantine style under strong architectural influence from the monasteries on Mount Athos known to Eastern Orthodox Christians as “The Holy Mountain”. It was the religious center of Achridos, one of the large Christian eparchies in Byzantium and Bulgaria during the Middle Ages. Archaeological findings and historical sources indicate that the Early Christian monastery in Bulgaria’s Kardzhali became the center of a bishopric towards the end of 9th and the beginning of the 10th century AD, and later – the seat of a metropolitan. The Bulgarian archaeologists discovered there five brick tombs, one of which had been hermetically sealed. Inside it, they found the relics of a senior Christian clergyman from the end of the 11th and the beginning of the 12th century AD . The tomb also contained a fully preserved gold-woven epitrachelion, the stole worn by priests and bishops to symbolize their priesthood, which also had saintly relics sawn inside a cross made of cloth – making it one of only four such finds in the entire world. The archaeologists believe that the epitrachelion was extremely expensive, and made in Constantinople, the capital of Byzantium; it is also taken to mean that today’s city of Kardzhali was an important center of Christianity during the Middle Ages. The partial archaeological restoration of the St. John the Forerunner Monastery started in the summer of 1998 with funding from the Future for Bulgaria Foundation, which provided USD 127,500, the Nikola Fichev – Zahari Zograf Foundation, and the Foundation of Father Boyan Saraev. The restoration was carried out under the supervision of Prof. Nikolay Ovcharov and Daniela Kodzhamanova from the Kardzhali Regional Museum of History (information about the Museum in English) which houses most of the archaeological finds discovered there. The monastery’s restoration is now going to be continued with the newly allocated funding from the Bulgarian government. On Easter Day 1999, the bishop’s church at the monastery saw its first liturgy in more than 7 centuries. It was consecrated in 2000. The St. John the Forerunner Monastery in Bulgaria’s Kardzhali was granted the status of “a monument of culture of national importance” by the Bulgarian Ministry of Culture in 1968 because of its artistic and architectural significance. The Early Christian Monastery “St. John the Forerunner" (The Forerunner is one of the nicknames of St. John the Baptist in Eastern Orthodox Christianity) is located near the city of Kardzhali in Southern Bulgaria, on the right bank of the Arda River in Kardzhali’s Veselchane Quarter. It was founded in the 6th-7th century AD after the end of the Iconoclasm period in Byzantium, and was part of a Byzantine bishopric complex called St. John Prodromos (prodromos in the Greek word for “forerunner"). The ruins of St. John the Forerunner Monastery were first discovered by local amateur archaeologists in the 1930s. More parts of monastery structures were found in 1962, and the entire complex was excavated by Bulgarian archaeologists in 1980-1984. The archaeological excavations have revealed that the St. John the Forerunner Monastery has four churches built consecutively one after another in a typical Byzantine style under strong architectural influence from the monasteries on Mount Athos known to Eastern Orthodox Christians as “The Holy Mountain". The Monastery was the religious center of Achridos, one of the large Christian eparchies in Byzantium and Bulgaria during the Middle Ages. Archaeological findings and historical sources indicate that the Early Christian monastery in Bulgaria’s Kardzhali became the center of a bishopric towards the end of 9th and the beginning of the 10th century AD, and later – the seat of a metropolitan. The Bulgarian archaeologists discovered there five brick tombs, one of which had been hermetically sealed. Inside it, they found the relics of a senior Christian clergyman from the end of the 11th and the beginning of the 12th century AD . The tomb also contained a fully preserved gold-woven epitrachelion, the stole worn by priests and bishops to symbolize their priesthood, which also had saintly relics sawn inside a cross made of cloth – making it one of only four such finds in the entire world. The archaeologists believe that the epitrachelion was extremely expensive, and made in Constantinople, the capital of Byzantium; it is also taken to mean that today’s city of Kardzhali was an important center of Christianity during the Middle Ages. 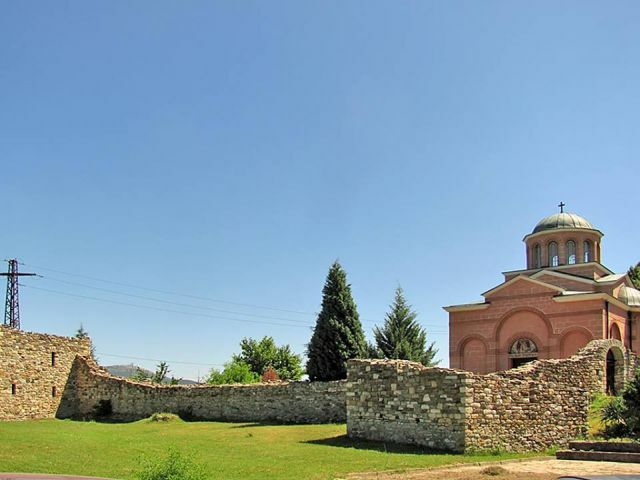 The partial archaeological restoration of the St. John the Forerunner Monastery started in the summer of 1998 with funding from the Future for Bulgaria Foundation, which provided USD 127,500, the Nikola Fichev – Zahari Zograf Foundation, and the Foundation of Father Boyan Saraev. The restoration was carried out under the supervision of Prof. Nikolay Ovcharov and Daniela Kodzhamanova from the Kardzhali Regional Museum of History (information about the Museum in English) which houses most of the archaeological finds discovered there. On Easter Day 1999, the bishop’s church at the monastery saw its first liturgy in more than 7 centuries. It was consecrated in 2000. The monastery’s restoration was continued in 2015 with BGN 800,000 (app. EUR 409,000) in funding from the Bulgarian government. The St. John the Forerunner Monastery in Bulgaria’s Kardzhali was granted the status of “a monument of culture of national importance" by the Bulgarian Ministry of Culture in 1968 because of its artistic and architectural significance.